I have a third child. His name is Gabriel. I will never get to hold him, see him, talk to him, nurse him, or sing him to sleep. And it makes me hurt every moment of every day. On Palm Sunday we found out we were expecting our third child. We were so happy...so, so happy. We've been trying for a long time to get pregnant, and it took us much longer than it had previously. Maria would be almost three and a half by the time the new baby was born, but no matter...they would be close enough to be friends! Almost immediately, the hyperemesis gravidarum started, earlier than it had with the girls. I had bloodwork done and it was beautiful. Everything looked wonderful, and we focused on keeping me fed and hydrated. We had tell tell the girls very early, because I was already so sick. But we (all four of us) were so happy. We had all been hoping and praying for a baby. All of the other wonderful Catholic couples we knew who had been married as long as we have have at least three children. Finally, our wait was over, and we began looking forward to the idea of having a new little one in our arms by the end of the year. Then we went for our first ultrasound, when I was seven weeks and one day pregnant. There was a heartbeat, but it didn't seem to be as fast as I remember the girls' heartbeats at that age. Our baby was also measuring a week small, and it was clear that something was wrong. We spent two weeks storming heaven with prayer, emailing tons of religious orders and asking them to beg God to spare our baby. Those were the longest two weeks of my life. The only pictures we have of Gabriel alive. A few days after that first ultrasound, I received Anointing of the Sick, because I was suffering so much from my hyperemesis gravidarum. I had already been living in bed or on the couch for about two weeks, struggling to find food I could tolerate and ways to stay hydrated. Struggling to find a position to lay in that didn't feel like pure torture. Dry heaving more times a day than I could count. As part of the Anointing, we also had our pastor bless the baby. I don't even know if he was alive any more at that point, but the blessing was so beautiful that it brought me to tears. My HG improved a little bit, but I hoped it was just because we had adjusted my medication, not because the baby had stopped growing. I was still terribly sick, though. And I knew. I just knew that something was wrong. I held out, hope against hope, that maybe all would be well. But I think that God was preparing my heart for the worst. I just knew that the baby wouldn't be alive by the next ultrasound, and I tried desperately to reassure myself otherwise. I had dream after dream of miscarrying, and I tried to brush it all aside. I begged God to spare my child. I offered up sufferings for him. But in my heart, I couldn't imagine him living. I just knew, in a way I can't explain. 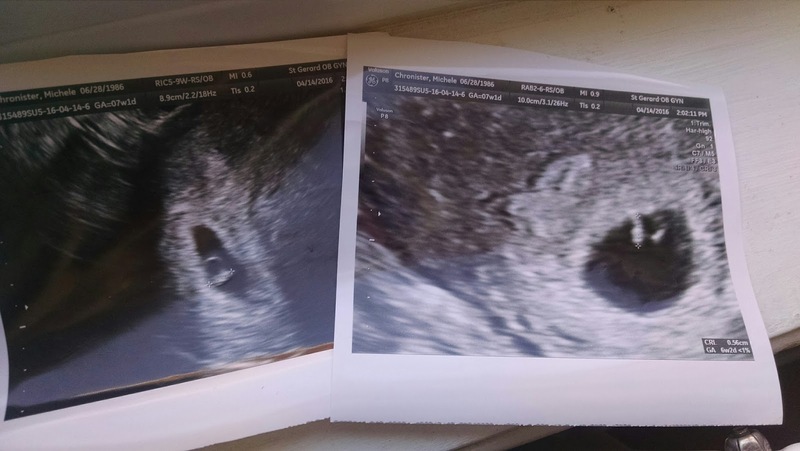 Sure enough, we went to my follow-up ultrasound at nine weeks one day, and the doctor couldn't find the baby at first. I thought I saw something that was the baby, but it was just a part of my uterus. When he finally found the baby there was no heartbeart, and he still measured six weeks one day (in fact, he looked like he had begun to shrink a little, which may mean he had died a while ago). I wasn't shocked, but I was heartbroken. And I will forever be grateful for this amazing, amazing Catholic pro-life doctor of mine. He took my hand and prayed with me. He spoke words of comfort to me and my husband. I hadn't miscarried naturally because I had been on progesterone support (preventing my body from passing the baby's body) and it was clear the baby was gone and probably had been for a while. I was still incredibly sick from the HG (which is common for HG moms who miscarry). We scheduled the surgery (to remove his remains) for very early the next morning. Through sobs I asked my doctor, "Please, when you deliver his remains...can you do a conditional baptism?" With tears in his eyes, he reassured me, "I will. I always do." We had to tell the girls. Maria was confused, but reassured by the thought of Mary, her patron saint, taking care of the baby. Therese was absolutely heartbroken and just sobbed in my arms. I told her, "Why don't you pick the baby's middle name?" We had felt like he was a boy (my pregnancy felt different than with my girls) so she flipped through her little picture book of saints, looking for a good boy saint. She landed on St. Gabriel of Our Lady of Sorrows, pictured with the sorrowful Mary, and said, "How about this one? Because Mary looks sad." I have long loved St. Gabriel the Archangel, so we decided that his name would be Gabriel (one name, but two patron saints). I slept for only a few hours that night, and woke up with a terribly headache (from dehydration and from crying so much) at 2:00 a.m. and couldn't go back to sleep. We had a friend come over to watch the girls and left for the hospital at 5:00 a.m.
My only "bump" picture, taken right before we left for my surgery to deliver Gabriel's remains. I tried to memorize every detail of that morning. Even if I wasn't delivering a living child, it was still the birthday of my third child, April 29, 2016. I remember the purple hospital gown I put on, and I tried to look carefully at the white and striped hospital blanket. And I stroked my belly, over and over again, low where his little body lay. I didn't really say good-bye, because I knew that he was long gone. But I also knew it was the final moments that I would hold his body inside of me. If you've ever had surgery before, you know that they verify your name, date of birth, and reason for surgery about a million times before the procedure. Every time I had to say out loud my reason for being there, my heart broke all over again. My baby was dead. My doctor came to see me right before, and I told him Gabriel's name (so he could use it in the conditional baptism) and jokingly told him, "Gabriel's guardian angel mentioned to my guardian angel that the place could use a little sprucing up in there. So, if you need to go make an Ikea run to tidy it up for the next kid..." My doctor started laughing. In that moment, empowered to laugh in the face of death, I thought, "O death, where is your victory? O death, where is your sting?" They wheeled me back, I drifted off to sleep, and woke up an hour later in recovery. Surgery had apparently gone smoothly, but as I woke up I heard my nurse buzzing frantically and making phone calls. "She needs the Rogam. Yes. Yeah. I know, can you get it to us? Her doctor ordered it." Before rolling me out of recovery she tenderly rolled me over and gave me a shot in my lower back. "Have you had this before?" In a rush, I realized what she was giving me. My blood type is rh negative, and with each of my pregnancies I've had to have a shot in case the baby's blood type was rh positive, to prevent my body from developing defenses that would reject the following baby. Since we didn't know Gabriel's blood type, I needed the shot, just as I had with my girls. "To protect your next baby," my nurse murmered, before delivering the painful shot. Somehow, that moment made it all too real. That connection to my previous pregnancies made my heart ache. Medically, it was impossible to ignore that a baby had lived and grown inside of me...and then died. In the days following, I've been surprised by how similiar my recovery process is to my previous (live) deliveries. I've had friends who have miscarried remind me, "It is a delivery, even if the baby you deliver is dead, and even if he's little. So go easy on yourself." My nausea still lingers, and I still need a little boost of HG medicine from time to time, but it's beginning to fade. Other physical symptoms haven't, and I've been surprised by the reality of "afterpains" even when the child you delivered was no longer alive and was very small. And the beginnings of post-partum depression have settled in, just as they did with my girls by this point. And it's been a hard weekend. This weekend was also deaconate ordinations for the seminary, and so I had to face a lot of people for the first time since losing Gabriel. I ran into a friend I hadn't seen a while, and she happily told me she was expecting! I congratulated her and then awkwardly told her we had just lost our third. And physically, I was just needing to (and continue to need to) rebuild my strength from an HG pregnancy. I was in bed for a good month, and I need to build my stamina back up again. I also continue to have occasional waves of nausea, as well as painful reminders of the trauma of HG. HG messes with your brain something awful. For the first few days, even thinking of my bed (where I spent a lot of time) made me want to dry heave. I had to keep reminding myself I could sit up, too, that I didn't have to lay down. But the worst thing is just missing Gabriel. I miss him with my whole heart. Andrew has assured me, over and over, "Just trust God. Trust that he knows what is best for Gabriel." In the midst of it all, I have this very strong sense that God chose us for Gabriel, and that Gabriel had and has a purpose in his plan. Without getting into the nitty gritty, his conception shouldn't have been able to happen when it did. My fertility has been off, Andrew had been traveling, and somehow everything aligned perfectly so that he could be conceived. Also, Gabriel probably shouldn't have still been alive when we went in for that first ultrasound. He had stopped growing a week earlier. I truly believe that God granted us that little miracle, of keeping him alive long enough that we got to see him alive, and had some time to prepare ourselves for the possibility of him not making it. I can't be mad at God right now, because I know how hard it is for us to conceive and Gabriel - the fact he existed at all - just seems like such an incredible gift. I don't know how to put into words, but I just have this sense that there's so much more to his life and his purpose that I will ever know in this life. But I know that Gabriel was no accident. He was meant to be in our family, meant to be surrounded with so much prayer and love for his brief time on earth. I somehow know, deep in my heart, that God chose me to be his mother, Andrew to be his father, and Therese and Maria to be his sisters. Gabriel was meant for us, and God entrusted us to prepare him for heaven in that short amount of time. We tried us best to surround him with love and prayer, and lots of prayers of blessing. I may not be mad at God, but I feel mad at the whole rest of the world, for just continuing to spin on its axis. As much as it hurts to lose him, right now it almost hurts more to know that we will probably struggle again with infertility, that I will have to suffer through another HG pregnancy, and that the space between our children will grow even more. People always say, "Oh, so and so is such a great Catholic family! They have (5,6,7,8...) kids!" No one ever says, "Those guys are such a solid Catholic couple! They have two kids, spaced about three years apart." It's hard to be in the pro-life community in a time like this, to be surrounded by so many pregnant women (I know six women who are due within weeks of when Gabriel would have been due), so many women who are on their second or third child since my last one and know...I don't know when I'll be able to have another child. And my heart and arms ache for a baby. On the flipside, it's a blessing to be surrounded by so many pro-life people. The support and comfort we've been offered in this time is overwhelming, and is definitely not the norm for families grieving a miscarried child. We've had people bring us meals (and one of our favorite priests even brought us ice cream the other night! ), send us flowers and gift cards, write us beautiful notes and emails, hug us, and promise to pray for us. We've had priests offer to say Mass for us, and countless seminarians offering to pray for us. I also have quite a few friends who have lost a child to miscarriage and stillbirth, and they are what has kept me from completely falling apart in the past few days. But despite all that...I just miss Gabriel. I miss him so much it physically hurts. And nothing can take that away. I don't want to be grieving. I don't want to have funeral home brochures lying around, or a little cloth on my desk waiting to be wrapped around his tiny casket...I want to have maternity clothes and brochures for birthing classes. I don't want him to be gone, but no matter how many times I say that, it won't change that he is. I just want Gabriel back. I miss him so much. And it really, really hurts. Oh Michele, I am so sorry. I felt in so many ways the same as you when we lost our baby 2 years ago. Thank you for sharing all you are going through. I will be praying for you! Oh Michele. This is absolutely heartbreaking. I just wish I could hug you in this time of terrible grief. Prayers for you and your family. Sweet friend, I am heartbroken for you. Thank you for sharing Gabriel's story so we could have the privilege to know him. We love you. This story feels all to familiar. Our daughter, Aubrey Lynn, died at 17 weeks. My children still talk about her like she's just another one of the group. My heart is breaking for you and with you. Oh Mary, wrap this precious family in your mantle. Keep them in your loving, motherly care. Never to leave them. Praying for you to be blessed with more children. May the Lord Bless you and keep you, may the Lord smile upon you and Be gracious with you! May the Lord show you favor and give you peace. In Jesus name. Amen. Oh Michele, I am so sorry for your loss. I know the heartbreak of losing a baby after trying for so long to get pregnant. I'm so, so sorry you are experiencing this pain. I wish I could do something to help. I will pray for you and your family and your precious little Saint Gabriel. Sorry, I don't reply to blogs much... Not sure how not to post as "unknown," but I am a real person. My name is Sandy. I'm so, so, sorry for your loss. My prayers are with you. Please, please don't worry about having larger spaced children, or people not thinking you are Catholic enough. All my children are spaced much, much, much further apart than your typical Cathlic family. It IS hard but YOUR family is exactly the way it's supposed to be and the way God wants it and please don't worry about what other Catholic families look like. Anyway, my thoughts and prayers are with you. I'm so sorry you are going through this. Love and prayers from another mama who's been there. My heart breaks for you. I am so sorry for your loss of Gabriel, but I can say you can know with certainty where he is. God is a loving God, he is all just and merciful. Knowing that, you know Gabriel is with the God of love. 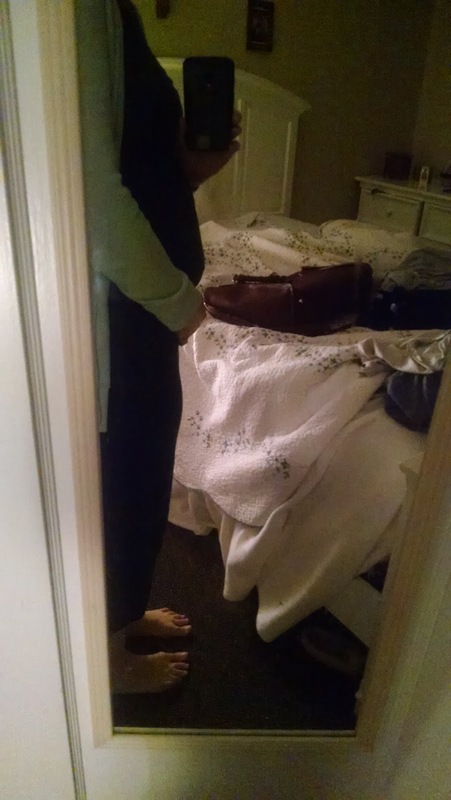 I lost 4 after my two boys, 3 of which in the second trimester. The last one was 12 years ago. The holes are never filled, but God gives me Consolation through Mary. And yes, part of the suffering is that I only have two when I am pro-life, but when I am feeling that way, I know it is from the evil one and I offer it up to God. May God bless you and your family for being such beautiful witnesses, let Him fill you with peace. Prayers for all of you, sweet friend. Thanks for letting us all know Gabriel. I am so, so sorry, Michele. I'll keep you and beautiful little Gabriel in my prayers. I'm so sorry you have to experience this. I know how incredibly heartbreaking it is. I'm glad you got to bury him. You will appreciate being able to visit him, and it's the best example of being pro-life you can give. You've valued his life, no matter how small. Praying for you. I'm so very sorry. Praying for you and your family and asking Gabriel to intercede for you from heaven. Many prayers! We lost our first sweet baby. Our priest really encouraged me that according to God's mercy, he or she is in heaven. Asking my little one's intercession for your peace and healing. May Our Lady of Sorrows hold you in her heart. Now I know that I was praying for you on April 29. Its the feast of St. Catherine of Siena, name saint of our daughter who died at birth. I offered Mass that day for all mothers who have lost children, especially those I didn't know, and I think in God's providence I was praying for you. My heart breaks for you, and I will remember you in my prayers. She also died when my husband worked at a seminary and the support of the priests and seminarians was a great comfort. And I believe the witness of you and your family is incredibly important for these young men. I am so, so sorry for your loss. It is so hard not being that fruitful Catholic family. I also have "just" two children, praying every day for another chance at motherhood. And I know, being in the pro-life world you are always surrounded by pregnant mothers. My priest told me to keep praying for more and more blessings for those around me, and I will keep you in my prayers too. Oh Michele, so many hugs and prayers for you. Thank you for sharing your raw heart and your pain with us. I am so sorry. Thank you for writing thia beautiful post and for letting ua know Gabriel. Praying for you. I"m so sorry for your loss. I have four babies in heaven and I ask them to pray for me often. If you are interested, there is a Facebook group called "Mommy to a Little Saint" that has been immensely helpful. (https://www.facebook.com/groups/378453748952136/) Also, the book "After Miscarriage: A Catholic Woman's Guide to Healing and Hope" by Karen Edmisten that is wonderful.